Astronomers have uncovered evidence for a vast collection of young galaxies 12 billion light years away. The newly discovered “proto-cluster” of galaxies, observed when the universe was only 1.7 billion years old (12% of its present age), is one of the most massive structures known at that distance. The discovery, made using telescopes at Kitt Peak National Observatory in Arizona and the W. M. Keck Observatory on Mauna Kea, has been reported in the Astrophysical Journal. “The protocluster will very likely grow into a massive cluster of galaxies like the Coma cluster, which weighs more than a quadrillion suns,” said Purdue University astrophysicist Dr. Kyoung-Soo Lee, who initially spotted the protocluster and is one of the authors in this study. Clusters this massive are extremely rare: only a handful of candidates are known at such early times. The new system is the first to be confirmed using extensive spectroscopy to establish cluster membership. Matter in the universe organizes itself into large structures through the action of gravity. Most stars are in galaxies, which in turn collect in groups and clusters. Galaxy clusters are commonly observed in the present-day universe and contain some of the oldest and most massive galaxies known. The formation and early history of these clusters is not well understood. The discovery of young proto- clusters allows scientists to directly witness and study their formation. The prevalence of massive clusters in the young universe can help constrain the size and expansion history of the universe. The other members of the team are Dr. Michael Cooper (University of California, Irvine), Dr. Hanae Inami (Observatoire de Lyon), Dr. Sungryong Hong (University of Texas, Austin), Dr. Anthony Gonzalez (University of Florida), and Dr. Buell Jannuzi (University of Arizona). Kitt Peak National Observatory and the National Optical Astronomy Observatory are operated by the Association of Universities for Research in Astronomy under a Cooperative Agreement with the National Science Foundation. The W. M. Keck Observatory is a scientific partnership between the National Aeronautics and Space Administration, the California Institute of Technology and the University of California, and made possible by the generous financial support of the W. M. Keck Foundation. The research was funded by the National Aeronautics and Space Administration and by NOAO. 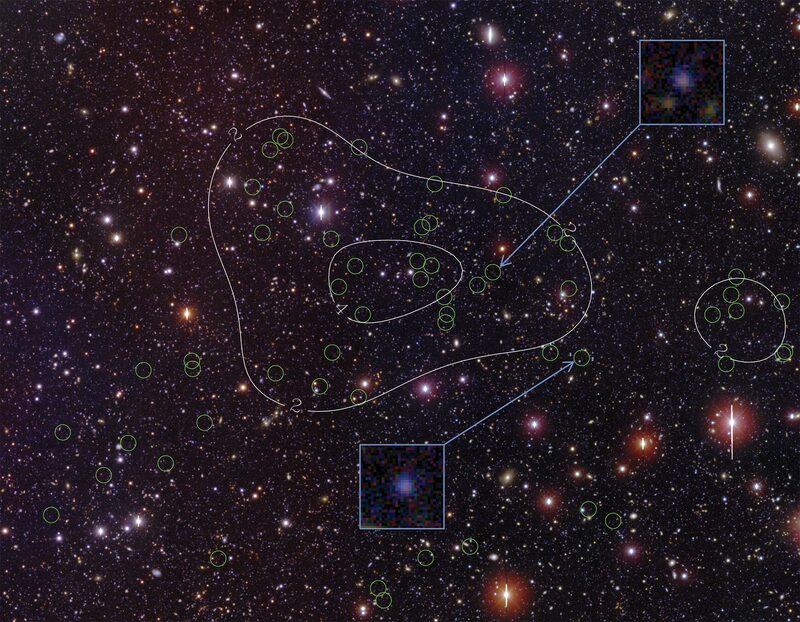 The newly discovered protocluster of galaxies located in the Bootes field of the NOAO Deep Wide-field Survey. Green circles identify the confirmed cluster members. Density contours (white lines) emphasize the concentration of member galaxies toward the center of the image. The patch of sky shown is roughly 20 arcminutes x 17 arcminutes in size. The cluster galaxies are typically very faint, about 10 million times fainter than the faintest stars visible to the naked eye on a dark night. The inset images highlight two example members that glow in the Ly-alpha line of atomic hydrogen. The protocluster is massive, with its core weighing as much as a quadrillion suns. The protocluster is likely to evolve, over 12 billion years, into a system much like the nearby Coma cluster of galaxies, shown in the image below. Credit: Dr. Rui Xue, Purdue University. 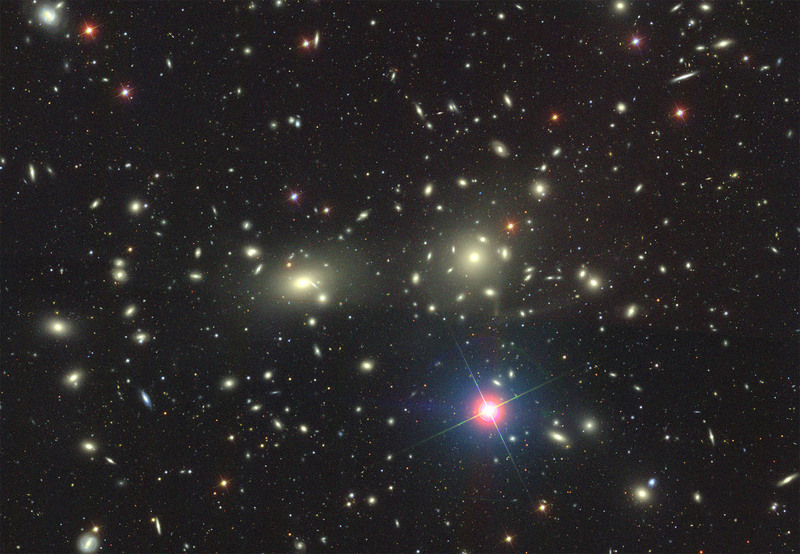 Coma Cluster image from the Sloan Digital Sky Survey. Credit: Dustin Lang and SDSS Collaboration.